Michael McFadyen's Scuba Diving - Qantas Sandringham VH-EBW Like most Australians, I am proud of our own airline, Qantas. I have flown numerous times with them and have always been impressed with the service provided and the quality of the flying by the pilots. It therefore came as a great surprise to discover on a trip to Vanuatu in 1991 that a Qantas plane had been wrecked there. 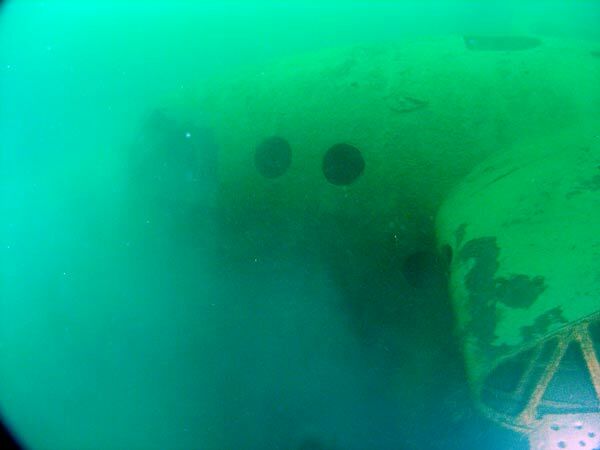 Even more surprising was the fact that the plane was still there, sitting upright almost completely intact 41 metres below the surface of the Port Vila Harbour. So what was the story behind this plane? In the late 1940s Qantas flew to numerous Pacific Islands, far more than it does today. It decided to expand its world-wide operations and therefore needed to increase its fleet of planes. 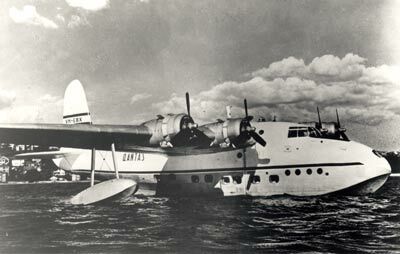 Because of the nature of the Pacific islands that it served, Qantas looked to purchase additional flying boats to augment its traditional flying boat fleet. However, there was still a shortage of new planes after the war and it made the decision to purchase used machines from other airlines. After a lot of searching, it purchased five Short Sandringham S25 Flying Boats. 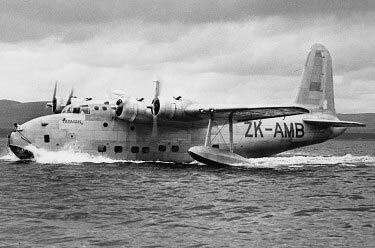 In 1934, the British Air Ministry asked Short Brothers (Rochester and Bedford) Ltd, the oldest airplane manufacturers in the World, to design a long range four engined flying boat. 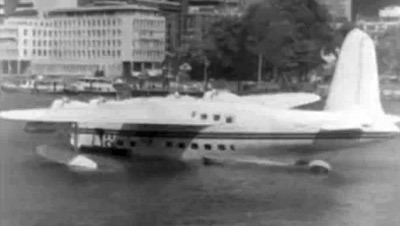 At the same time, Imperial Airways (later to become British Overseas Airways Corporation - BOAC and then British Airways), in conjunction with Qantas Empire Airways, asked Shorts for a flying boat capable of carrying 24 passengers from London to Sydney in seven days. Shorts came up with the S.23 "Empire" "C" Class flying boat, of which 42 were built. The military version, designated S.25 "Sunderland", was first flown in 1937. It looked quite different to the civilian version, with a totally different cockpit and nose area. A total of 749 Sunderlands (Mk I, II, III and V) were produced by Shorts. In 1944 a Sunderland Mk III (Serial SH113) was built by Short Bros at Rochester, Kent, England under contract 2226. Mark III Sunderlands had a wingspan of 34.4 metres and were 26 metres long. Their empty weight was almost 15,000 kg and their maximum takeoff weight was 26,308 kg. They were powered by four 1,066 hp Bristol Pegasus XVIII nine cylinder radial engines. Sunderlands had a maxium speed of 341 km/h and a cruising speed of 233 km/h. Their service ceiling was 15,000 feet. Sunderlands had an endurance of 20 hours when operated to optimum. Each was armed with one Vickers 0.303 inch machine gun in the nose turret, two Browning 0.303 inch machine guns in the upper turret, four Brownings in the tail turret and four fixed Brownings in the nose and twin Browning 0.5 inch machine guns in each of the waist hatches. It could also carry 2,250 kg of bombs. A total of 461 Mark III Sunderlands were built. This new Sunderland was delivered to the Royal Air Force as ML761. On 7 March 1944 it was sent to RAF Calshot. This was located at the end of Calshot Spit in Southampton Water, Hampshire, England. Calshot was the main seaplane/flying boat development and training unit in the UK. On 9 April 1944 ML761 was sent to 57 Maintenance Unit of the RAF. This was located at Loch Ryan, Wig Bay, Scotland. This is located about 110 kilometres south-west of Glasgow and only 30 or so kilometres from Northern Ireland. The 57 MU did servicing work on flying boats. It was here less than three weeks as on 22 April 1944 ML761 was sent to Marine Aircraft Experimental Establishment (MAEE) Helensburgh. This is at Rhu, just west of Helensburgh in Scotland. Helensburgh is located on the northern side of the Firth of Clyde, about 35 kilometres WNW of Glasgow and opposite Greenock. This was the home of world shipbuilding from the early 1800s till just after World War II. The MAEE modified existing aircraft (including captured German planes) for various roles. 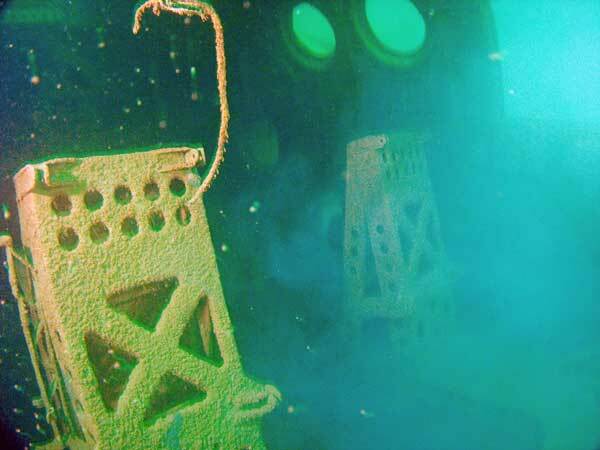 One of the projects was using Sunderlands to work out how to sink the German ship Tirpitz. The plan was to use chariots (a sort of human torpedo) and using modified Sunderlands to drop and retrieve the chariots. However, it never proceeded to being used against the Tirpitz. On 23 July 1945 ML761 was transferred again to MU 57 at at Loch Ryan, Wig Bay, Scotland. Sometime after this ML761 was sent to Short Bros & Harland to be modified into a Sunderland Mk V. The main differance was that the Mark V had far better engines. The Bristol Pegasus engines were removed and replaced by the American Pratt & Whitney Twin Wasp. The Twin Wasps were R-1830-9OB 14 cylinder radial engines producing 1,200 hp each. I am not sure of the increased performance using these engines. On 17 January 1946, ML761 was sent back to 57 MU. On 18 March 1946 it was sent back to Short and Harland as surplus to the post-war needs. This plane does not appear to have ever had much action, it certainly does not appear to have ever been used for rescue work. During December 1942, six Sunderland Mk IIIs were modified to civilian use and after the war another 18 modified. These became known as "Hythes". One of these was then further modified in June 1946 and became the first Short Sandringham Mk I. After the war there was an excess of war-surplus military aircraft and between 1946 and 1948 Short Brothers, the original manufacturers of the Sunderland, converted another 26 (giving a total of 27) Sunderland Mk V aircraft into passenger carrying Sandringhams at their Belfast plant. They were sold to various airlines throughout the world, with BOAC purchasing a total of 13 aircraft, exactly half the total production. Of interest is that the Belfast plant where the conversions took place (and indeed where some may have been originally produced) was owned by Short and Harland, Ltd. This company was set up in June 1936 by Short Brothers (Rochester and Bedford) Ltd and Harland and Wolff Ltd (manufacturers of the RMS Titanic and, of more relevance to the Qantas plane, the Star of Russia, a ship now found at the bottom of Port Vila Harbour only a few hundred metres from ML761) to manufacture Shorts aircraft. The Short Sandringham was produced in seven marks, with each having a different internal layout. Some had sleeping quarters, dining room or bar as well as the seating compartment. Apart from the Mk1, the mechanical components were basically identical in all the Sandringhams. Powered by four 1200hp Pratt and Whitney R-1830-92D Twin Wasp 14 cylinder two row radial engines, the Sandringham had a cruising speed of 283 km/h and a range of 3,943 kilometres. The planes had a wingspan of 34.4 metres, a length of 26 metres and a height of 10 metres. The modified plane had a tare weight of 15,505 kilograms and a maximum take-off weight of 25,425 kilograms. owned by Edward J. Hulton (Juliet Flying Boats Inc). This is in London on the Thames River. Note: As you will notice, the plane in these two photographs has a much more squared nose than the ones in the photos below. 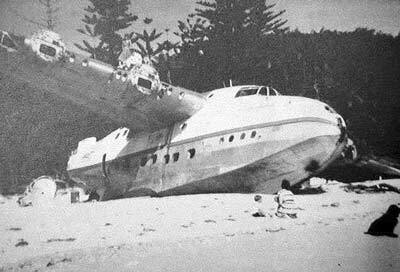 It was a conversion from a Sunderland done in 1964 in Sydney for Ansett Flying Boat Services. This plane started its history, as Sunderland ML814 with the RAF. It was sold to RNZAF in 1953 as NZ4108, then to Ansett in 1963 as VH-BRF. In 1974 it was sold to Antilles Air Boats, Virgin Islands becoming N158J. 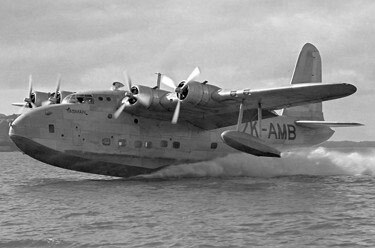 They sold it in 1979 to Edward J. Hulton (Juliet Flying Boats Inc) and became G-BJHS. In 1989 it was leased to Ryanair and in 1991 it was sold to Weeks Air Museum, Miami, Florida. It did not arrive in the US till 1993 and was registered N814ML. It is no longer airworthy and is on display at the Fantasy of Flight Museum, Miami, Florida. See Aussie Airliners VH-BRF Page for more information. 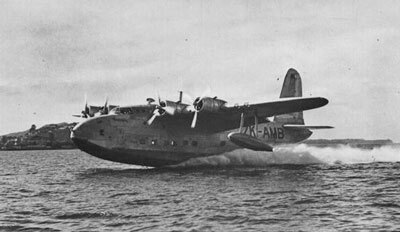 In 1946 Short Sunderland Mk V (originally Mk III - Royal Air Force number ML761) was converted into a Short Sandringham S25 Mk 4 at Shorts Belfast factory. It was given the conversion number SH30C. It was then transferred to UK Ministry of Transport and Civil Aviation. On 5 July 1946 it was entered onto the New Zealand Aircraft Register as ZK-AMB and on 17 July 1946 it was leased to Tasman Empire Airways Ltd (TEAL - the forerunner of Air New Zealand). Some sources say that the plane was sold to TEAL, I am not sure which is correct. The aircraft was named 'RMA Tasman' (RMA = Royal Mail Aircraft). The "new" plane was one of four Mk4s aquired and they were called the "Dominion" class, although I have also seen them referred to as the "Tasman" class. The plane was delivered to TEAL at Auckland in August 1946. The commander of the flight was Captain D. Travers (BOAC London-Sydney) and Captain A.V. Jury (TEAL Sydney-Auckland). I presume the planes were used on the Australia to New Zealand route was well as routes to Pacific islands. The plane was withdrawn from use due to engine overheating problems on 23 February 1948. It was returned to service following rectification of engine problems on 17 June 1948. It operated its final TEAL service in December 1949 and was then stored at Hobsonville, Auckland. TEAL had only kept the planes for four years, as they considered them underpowered and replaced them with new flying boats. Eventually, all four planes would end up in Australia with Qantas and Ansett Airlines. Between 13 April 1950 and December 1951, Qantas purchased five Sandringham Mk 4 and Mk 5 aircraft, two from TEAL. They were ZK-AMD and ZK-AMB. The five aircraft were registered VH-EBV to EBZ. On 18 April 1950 ZK-AMB was sold to Qantas Empire Airways Ltd and entered onto the Australian Aircraft Register as VH-EBW on 24 April 1950. In the official history of Qantas by John Gunn (Challenging Horizons) the new plane does not have a name attached, although the other Sandringhams were christened "Pacific Chieftain", "Pacific Warrior", "Pacific Explorer" and "Pacific Voyager". This is probably because the last three planes were not received by Qantas till after VH-EBW was lost. In any case, the dive shops in Port Vila, Vanuatu, and some diving articles refer to the plane as the Qantas "Tasman" although this was the name when it was flown by TEAL. Immediately placed into service on the Pacific runs, VH-EBW soon set a Trans-Tasman record between Australia and New Zealand of just under eight hours. 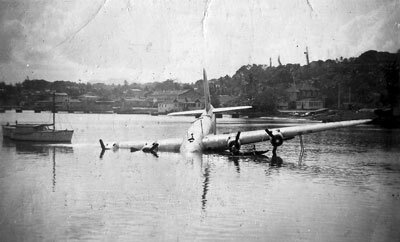 However, on 4 April 1951, less than one year after it was purchased, the plane was seriously damaged while landing at Rose Bay in Sydney Harbour under the command of Captain Hugh "Smokey" Birch, DFC, MID. Extensive wing and float damage occurred when the failure of the port stay wire caused the starboard float to break off and the wing to dip into the water. The plane was saved by the crew and passengers climbing out onto the port wing and balancing the plane to keep the other wing out of the water. An interesting aside is that Capt. Birch was the first pilot to ever land a Sunderland Flying Boat (the plane from which the Sandringhams were derived) on the open Atlantic Ocean when in World War II his plane rescued some torpedoed seamen. Repaired and placed back into work, only two months later VH-EBW had another even more serious accident that was to end its flying days. On 10 June 1951, with Captain P.J.R. 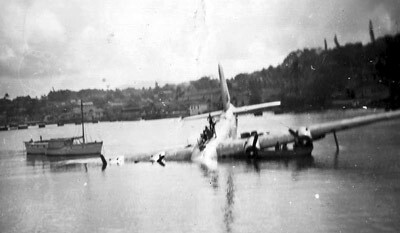 Shields at the controls, VH-EBW was attempting a take-off in Port Vila Harbour en route to Santo when it had to avoid a dugout canoe powered by an outboard that strayed into its path. Unfortunately, this action forced the pilot to turn hard to starboard and the plane struck a coral noggerhead (outcrop) and the hull was holed in several places. In about 1994 I spoke to Hugh Birch (see paragraph above - he died on 3 January 1996) who was not crewing but a passenger on the plane and he confirmed this story to me. This was also confirmed by Elvy Hugo, widow of Trevor Hugo who was a steward on VH-EBW when the incident happened. The pilot rammed the plane up on a nearby beach and although the plane did not sink, it was extensively damaged to such an extent that Qantas wrote the plane off and abandoned it in Vila. It lay for some time near Irriki Island Resort (then the British Commissioner's Residence) until the authorities tired of it. Either soon after the accident or while abandoned, the plane was stripped of its engines and other valuable items. 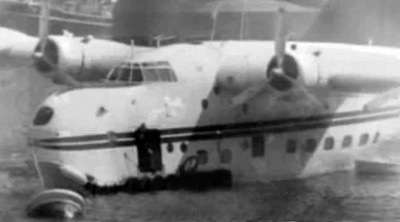 A photograph shows the plane at a dangerous angle with men in a small boat attempting to remove the engines. 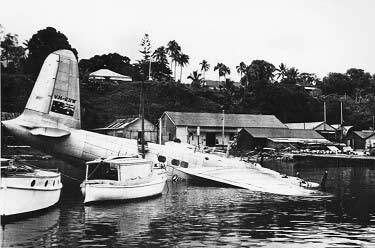 Eventually the plane was scuttled in a corner of Port Vila Harbour and lost and forgotten. In 1978 Reece Discombe (rediscoverer of the location of Laperouse's shipwrecks in the Solomon Islands and famous resident of Port Vila - died about 2008) told some scuba divers where the plane might be located. Denny Smith with his son Justin Smith sacrificed many lunch hours searching for the plane via depth sounder. 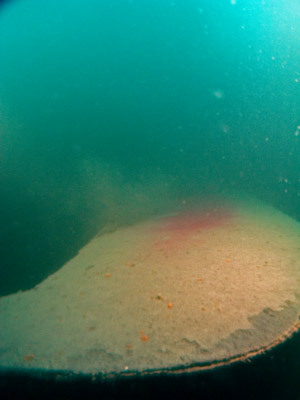 They found it and Justin, his mother Merrell and the late Frank King were the first to dive it. 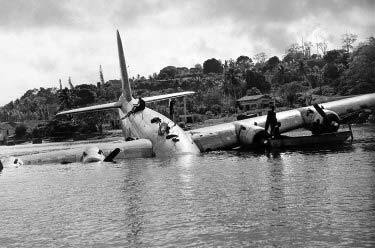 The wreck of the aircraft was lying upright a fair distance from where it was originally scuttled. 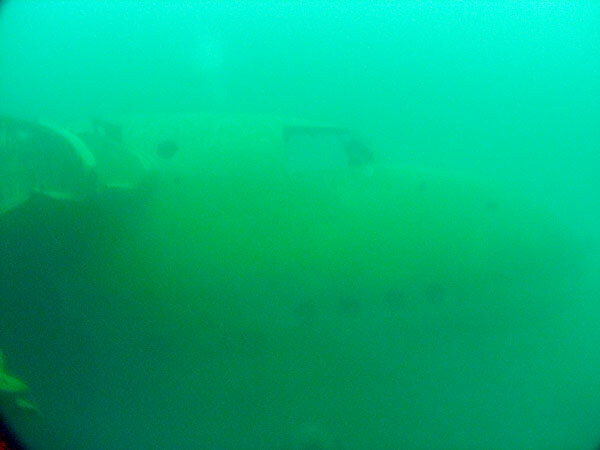 It appears that the last flight of the Sandringham was actually underwater as it glided to the bottom over 40 metres down. 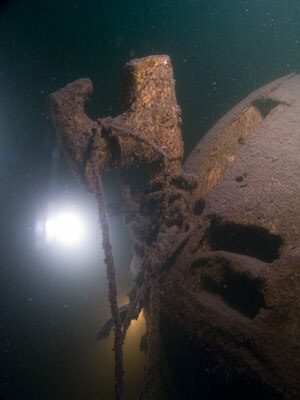 Today the wreck is a popular diving site for visiting Australian divers. Its depth makes it an excellent build up dive for divers travelling to the northern island of Santo to dive the famous wreck of the SS President Coolidge, but it is an excellent dive in its own right. In 1991, 1995, 2007 and 2010 I had the opportunity to dive the plane and found it an exhilarating dive. 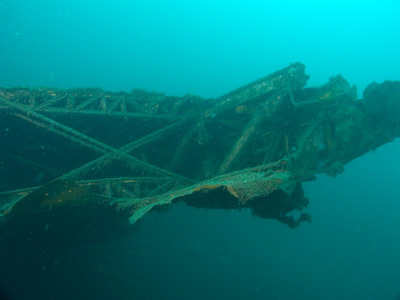 The wreck is located in the south-eastern corner of Port Vila Harbour between the main passenger wharf and the navy base. Its location is GPS S17° 45' 16.2" E168° 18' 34.2" using WGS84 as the datum. There is a mooring here. 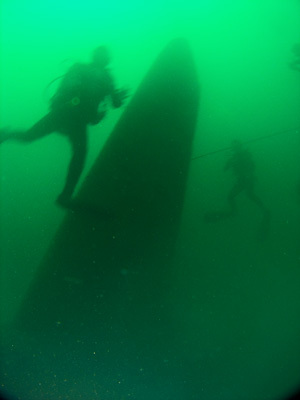 After submerging, you sink into the water, following the dive boat's mooring line. As you approach the 30 metre mark, you see the tail-fin jutting up out of the gloom. 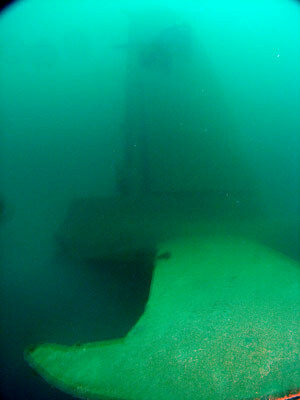 The top of the huge tail is at a depth of 35 metres and the top of the hull is 38 metres down. The visibility here drops dramatically, only two or three metres on two of the times I have dived here (10 metres on the other two dives). The rudder is very corroded as are the tail wings, with the port one cracked at its base and drooping down. If you look carefully at the port side of the tailfin, you will see that the registration number of the plane, VH-EBW is visible, as is the remains of the Qantas logo. After quick look around the tail area, you travel forward towards the nose. The wings are mostly intact except for where the engines were removed. The wings are so big that near the hull you can swim inside sections of them. These compartments used to hold two life rafts each in case the plane went down over the ocean. You can see them on the port wing. Below the wings, the side windows are clear, with the perspex long gone. This enables you to look into the upper and lower decks. In front of the wings, perched high above the sandy bottom is the cockpit. Like the other windows, the windscreen is also clear except for a section on the port side where a broken piece of perspex remains. Like the rest of the plane, the perspex is covered in a layer of silt. Inside the cockpit, the seat frames remain and you can see the gauges and controls and the remains of the gauges that once enabled the pilots to fly the great plane. 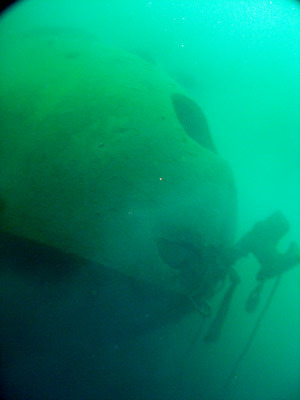 In front of the cockpit, 26 metres from the tail, is the mooring ring, still with a rope attached. Just above this is the observation hole that enabled the boat to be manoeuvred and moored safely. It used to be still covered with its perspex covering, but in 2010 I think it was missing. 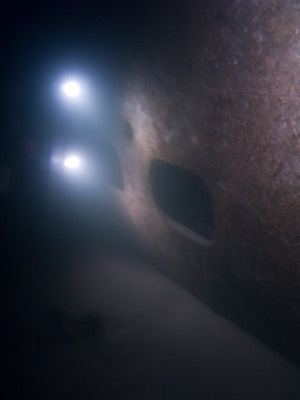 Below here the hull tapers away from the nose towards the rear, the sand at 41 metres enabling it to sit higher than it would have in the water. Below the cockpit on the port side there is the main cabin door. With care, you can enter the plane and explore the lower deck. As you follow the line that runs to the rear through the three main compartments, you can see the frames of the seats as well as other fixtures of the plane. It is a tight squeeze, but with care it is not too hard to explore the interior. You can return to your starting point or exit out the rear door on the starboard side. The plane used to lie with its port wing lying on the sand and the starboard up in the "air" but in 2010 it seemed to me to be level. Behind the starboard wing is the cargo door which enables you to enter the rear cargo compartment. You can swim into the compartment and exit through a large hole in the tail. This is a very safe and easy penetration, although care needs to be taken to not silt up the floor. 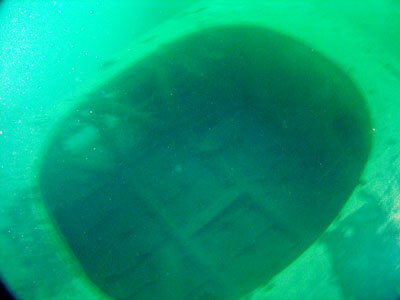 This is a very large plane, almost 35 metres across the wings, and at this depth it is not possible to examine in minute detail the whole wreck in the one dive. 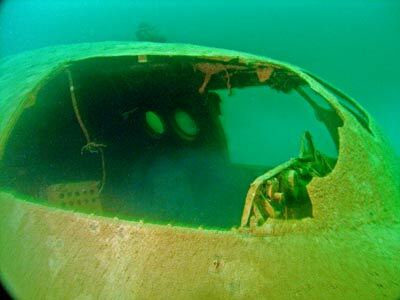 This fascinating piece of Qantas's history will be around for a long time and many more divers will be able to enjoy it. I can certainly recommend the dive as being worth the time and money, do not let anyone talk you out of it. Visibility here is not great, normally only two to four metres, but I have had about 10 metres on two dives. Even the lower levels of visibility are more than adequate to explore the plane. 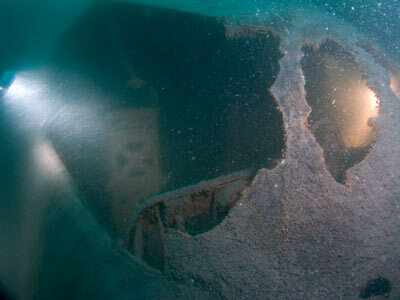 Due to the depth and very poor visibility, I would only recommend that experienced divers do this wreck. 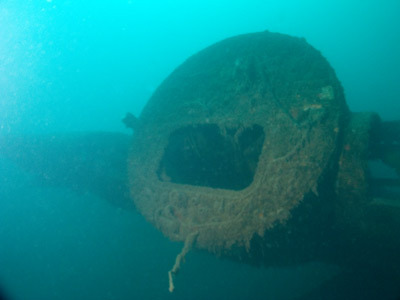 There is another almost identical plane to this that can be dived. 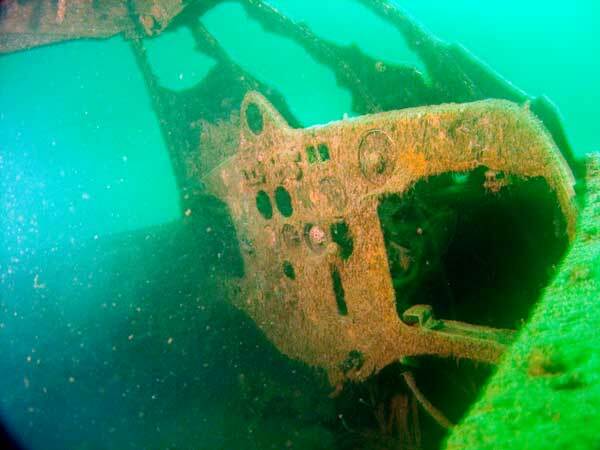 This is a Short Sunderland Mk1 which sank in 1939 in Milford Haven, Pembroke, Wales. 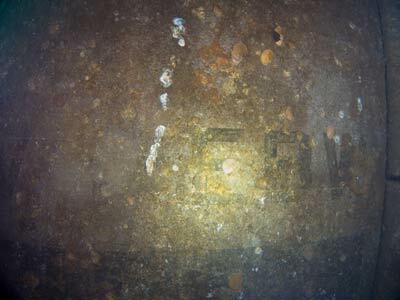 However, the Port Vila plane is more intact and certainly more is visible as the Sunderland is 80% buried in mud/silt.